Bananas Are On Their Way To Extinction! The days of the banana we all love and need are numbered. A banana-killing fungus is ravaging the crop in every country it's grown in. According to a new study published in PLOS Pathogens, the fungus that was found 50 years ago in East and Southeast Asia (including the Philippines) is going global. Since 2013, the fungus has gone to South Asia, the Middle East, Africa, and Australia. The fungus strain responsible for the end of the popular fruit is called "Tropical Race 4," and it's a clone of Panama disease. Panama disease drove the banana crop Gros Michel (found in Costa Rica and Panama) to near-extinction in the 1960s. Yes, it's happened before. Tropical Race 1, a cousin of the Race 4, wiped out Latin America's banana plantations in the '60s. Scientists eventually discovered the Cavendish, a cultivar that could resist Race 1. That's the crop many of us eat today. Unfortunately there's now a Race 4 that threatens the number of Cavendish across the globe. And Tropical Race 4 is more highly evolved than its relative, hence killing Cavendishes with ease. And when it does, the $11 billion global banana trade will collapse. Farmers in many poor countries where bananas are a staple crop will suffer—the crop is part of their livelihood, and it's their food too. What makes it possible for this fungus to quickly drive a kind of banana into extinction is the banana itself. 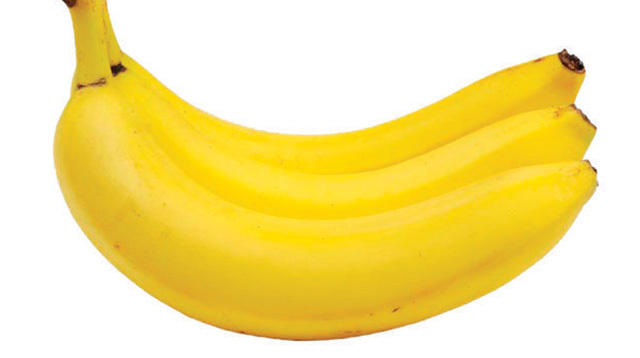 Commercial bananas are clones of each other. They can't sexually reproduce and they can't evolve, so they don't have any protection against diseases. And Panama disease spreads through a soil-borne fungus (Fusarium oxysporum f.sp. cubense) and water. When it comes in contact with a host, it goes up to the plant's roots, killing the plant and the surrounding banana plots. Contaminating the soil, the fungus stays there for up to 30 years after the crops have died. As of now the fungus can't be stopped. So it's a matter of time before it hits Latin America, where three-fifths of the planet's exported bananas are grown. The study has shown that quarantine efforts have been ineffective, and that there's so much more to still be known about the fungus. What scientists do know is that Tropical Race 4 takes a while to spread—the only good news we have for you on this news. Still, the end will happen for the banana unless there's a breakthrough discovery on combating the Race 4. New banana cultivars can be developed, of course. But that will require loads of money for research and development, not to mention time. Hopefully institutions can invest on it, considering people eat more bananas these days than in the past.